Fruitless Pursuits: Dungeons and Drongos Episode 7: The Bogan Bash, Part 2! 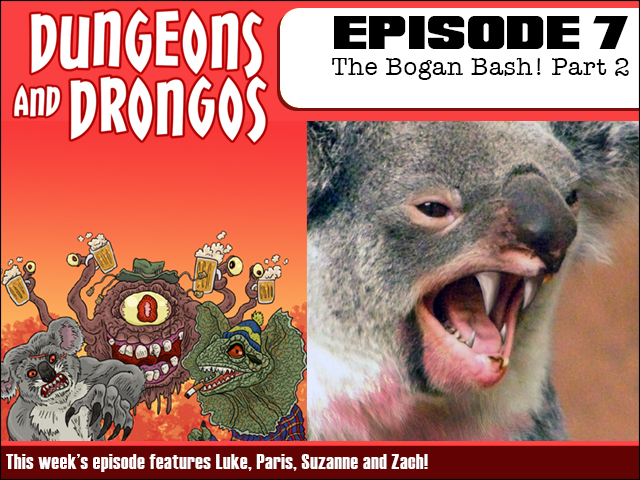 Dungeons and Drongos Episode 7: The Bogan Bash, Part 2! In this week's epic conclusion to The Bogan Bash, McKenzie, Gadai and Plank find themselves trapped inside the drunken city of Hogan's Knife as two uninvited guests rain deadly dropbears onto the bogan wedding of celebrity couple Nathan "Nuggo" Worthington and Kayleigh Lotto. Can our heroes make a difference? Can they even survive?